When hooking hardware up to your DAW via an audio interface, you need to ensure you’re sending appropriate levels to your gear. 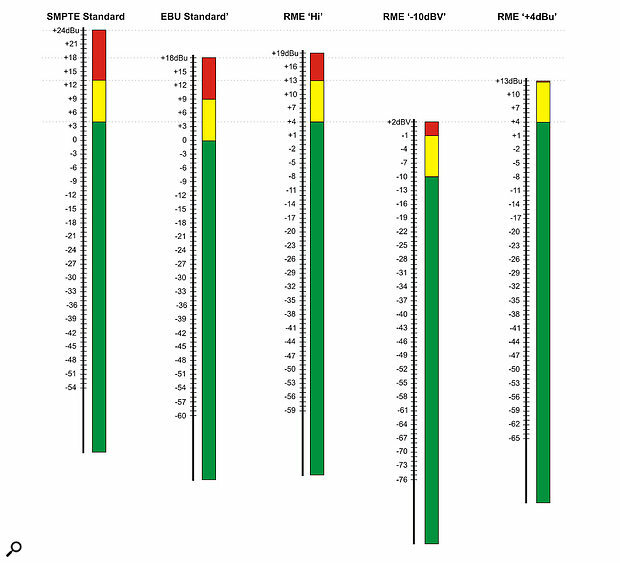 Here you can see how the three RME level settings relate to the SMPTE and EBU analogue standards. I recently ordered a matched pair of Warm Audio EQP-WAs [Pultec EQP-1A EQ clones]. As these have no level or peak indicator, what would be the correct way to output the signal from my DAW (Logic) via an RME Fireface 800 audio interface? Let’s say I was running a full mix outputting at 0dBFS through the unit. Should I reduce the output level to -16dBFS (ie. +4dbu) in either the routing software or DAW, or is there a piece of hardware that’s preferable? Also, is there any point/scope in deliberately overloading the unit slightly for saturation? Hugh Robjohns replies: The EQP is old-school analogue equipment and it expects to work with old-school analogue signal levels. That means average signal levels around +4dBu with very occasional transient peaks up to maybe +18dBu or so. There are several ways you can achieve this. The first (and most practical, in my view) is to maintain analogue-style headroom margins in your DAW as you track and mix your music. (Mastering is an entirely different situation, because of the bonkers historical practice of stripping off headroom on CD releases.) For more on that subject, check out our ‘Gain Staging In Your DAW’ article in SOS September 2013 (www.soundonsound.com/techniques/gain-staging-your-daw-software). So, if you work with average levels around -20dBFS in your DAW, with very occasional transient peaks up to -6dBFS, you have a similar working range to traditional analogue. Couple that with an interface calibrated to provide +24dBu for 0dBFS and everything works seamlessly with analogue gear. The DAW and the analogue gear both clip at the same point (0dBFS / +24dBu), they both have the same nominal reference level (-20dBFS / +4dBu), and they both have a 20dB headroom margin. (They also both have similar noise floors at around -114dBFS / -90dBu). The closest RME interfaces get to this is in their Hi-Gain mode, where 0dBFS is aligned to +19dBu — being a German company they’ve adopted the EBU spec, but they’ve allowed an extra 1dB of headroom just to be helpful. On the other hand, if you’re still wedded to the notion of hitting the DAW endstops all the time, you can make use of RME’s adjustable headroom facility to take the strain out of the analogue interfacing. Just set the RME interface to operate in its -10dBV mode on the input- and output-level settings. This will align the DAW’s 0dBFS with +4dBu in the analogue world, so your heavily squashed and peak-limited music will sit right on the nominal operating level of the EQP-WA. If you want to drive the EQP a little harder (it won’t hurt to try), use the +4dBu setting on the RME interface. This aligns 0dBFS with +13dBu, which is pretty darn hot in analogue terms. I’ve included a comparison chart above, showing the three RME interface level modes in comparison with the standard EBU and SMPTE operating alignments.